There's a new jewelry craze in NYC, and you have to get it welded on. 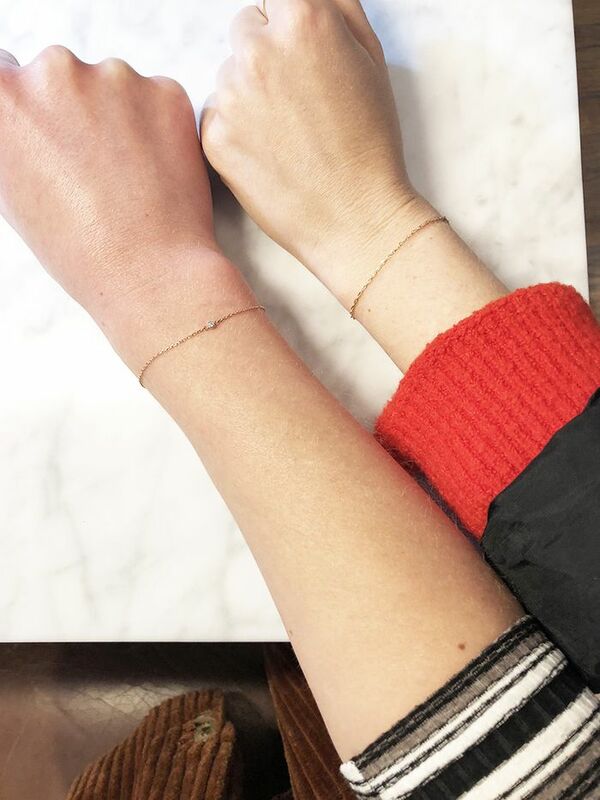 Allow me to explain: Every cool girl's go-to source for delicate gems is the Brooklyn-based Catbird, and earlier this month, it launched a Welding Annex next to its brick-and-mortar store, where the team is welding 14k gold chains onto peoples' arms for $94. Since it's impossible not to be intrigued by this, we did a little investigating and found that it's not as scary as it sounds. The delicate Forever Sweet Nothing Bracelet is being coined as "the ultimate friendship bracelet," and with the help of a pair of pliers and a little fire, the chain is sized to fit perfectly and quickly zapped onto the wrist by a Catbird jeweler. There's no clasp, and it requires no maintenance and can easily be removed with scissors. Find out more about new Catbird's permanent jewelry below (as well as a quote from its co-creative director), and shop other delicate bracelets by the brand in case you can't visit the Annex IRL. Update: I recently visited the Welding Annex for myself and I now want an arm full of permanent bracelets. I can't stop staring at mine, and it's so light and perfectly fitted that I never even notice it. The process was quick and painless, and they've even added Forever Tiny Corsage Bracelets in both yellow gold and rose gold (which is what I opted for) with a small diamond. See our welded-on bracelets below! One is forever and one is not!! ⚡️Our Welding Annex is open today from 2 to 7, and Saturday from 12 to 5⚡️ Come say hi - get zapped! We can be friends forever. • 540 Driggs Ave / No appointment necessary / $94 + tax - credit card only! See you there, Kittens! Our newest house of love, our Welding Annex. Let’s be friends forever! ???? We have some exciting announcements coming soon about the Welding Annex, Kittens! New ways to get zapped. ⚡️✨ The Catbird Welding Annex is open for walk-ins on Friday’s (2 to 7) and Saturday’s (12 to 5). A Forever Sweet Nothing Bracelet is $94 (plus tax - credit card only). ✨Ask & you shall receive!✨ By popular demand, we bring you the Catbird WELDING Annex! Just a few blocks away from our Bedford Ave. store, we've created a new home for Forever Sweet Nothing Bracelets. Starting this Friday, the Welding Annex will be open every Friday & Saturday. First come, first serve - come in, get zapped, leave sparkling. ✨✨✨ The Deets: Where: The Catbird Welding Annex - 540 Driggs Ave. When: Fridays 2 to 7 & Saturdays 12 to 5 Price: $94 + tax for your 14k Yellow Gold Forever Sweet Nothing. See you there, Kittens! Catbird Co-Creative Director Leigh Plessner filled us in on how the Welding Annex came to be. She explained, "Long before opening our welding space, most everyone at Catbird had been zapped by our in-house studio jewelers, and we're known to also zap guests who visit the Catbird HQ. This past spring we hosted a one night only event to bring this experience to customers. We had lots of wine and two Catbird jewelers on hand to weld with our Sweet Nothing 14k gold chain. It was on a rainy evening and only went to 7 p.m.—we anticipated people would come through steadily, but the turnout far exceeded our expectations." She added, "What we loved most was how many friends and sisters (and couples!) came in to get welded as an expression of a bond. That was really special to see. Soon after we decided to do a quick renovation of our former engagement and wedding showroom and officially opened the Catbird Welding Annex three weeks ago! We opened our doors with the Forever Sweet Nothing Bracelet, and this weekend we will be expanding to offer the Forever Sweet Nothing Anklets as well. There will be a few more pieces released into the Catbird core line—with a traditional clasp—and as a welded option to be forever worn. We're obsessed with our jewelry being effortless—if we find you have to fuss with it when we're in the sampling phase, we move on immediately. So our pieces are really natural to move into permanency. There is a lot of wear testing going on in our studio right now." Location: 540 Driggs Avenue, Brooklyn, New York 11211 Hours: Friday 2 p.m. to 7 p.m. and Saturday 12 p.m. to 5 p.m.